On Sale! Up to 3% off on Ventilation Fans at Verso Laquila. Top brands include AC Infinity, Craftmade, Aero Pure, Teiber, Hunter Fan Company, & Broan. Hurry! Limited time offers. Offers valid only while supplies last. 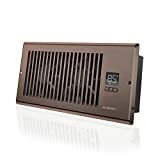 NuTone Model Decorative Oil-Rubbed Bronze Fan/Light, Frosted Glass, 70 CFM, 2.0 Sones, 13-3/8"